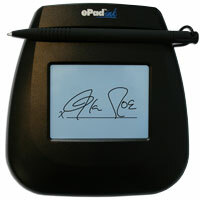 ePad-ink™ is used worldwide to capture electronic signatures, whether the signing takes place in-branch or in-field. With an LCD screen that lights up when an esignature is applied or affirmation text displayed, the interactive visual feedback provides an enhanced user experience. Ergonomic and portable, ePad-ink is a best-in-class eSignature solution. Use it with Integrisign plug-ins for popular desktop document formats, or powerful SDKs to integrate with third-party platform or build your own custom application.